As I have told you guys, my desire is not only to learn to catch all types of fish, but to teach others to do the same! Take my buddy Luis. 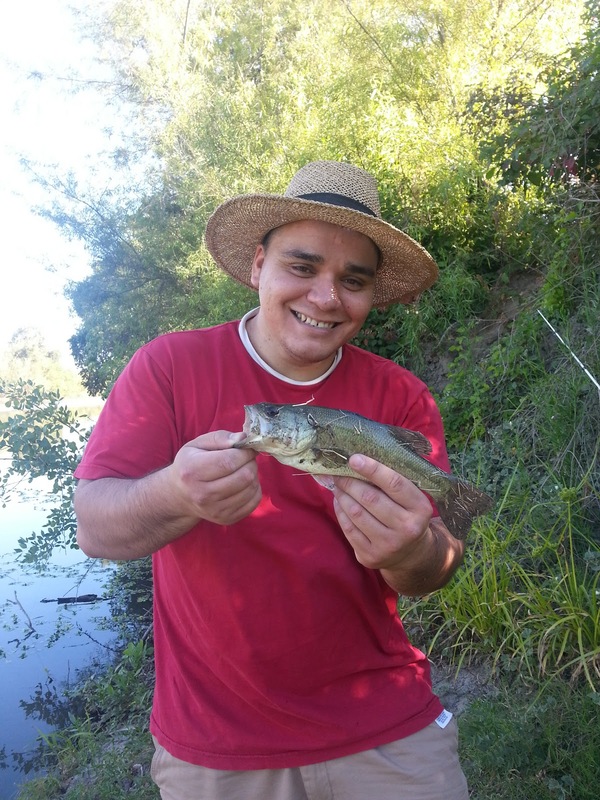 Luis loves to play video games, watch movies and anything else indoors. He isn't much into anything outdoors but I want to get him into fishing. We have been trout fishing before and he hooked into his first fish ever with me, but he still wasn't excited about the "waiting" part of fishing. That's why i decided to take him fishing for panfish; i figured having him focus on a bobber was better than staring at a rod tip. Anyway, We arrived at Lisbon Slough in Woodland at 6pm fishing for panfish. I decided to do some recon and search for a spot I had seen from the other side of my usual spot. A few weeks ago I saw a guy fishing that spot and so we set off on a mission to find it. Sure enough i found it and let me tell you, it as better than I thought it would be. As it turns out, beyond what my eye could see, there was a small creek feeding into the slough right at that spot. along with some nice vegetation, this spot was pretty much perfect! I set Luis' line up first and within the first five minutes he had his first take down. 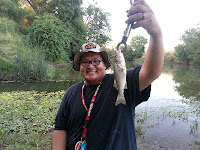 Unfortunately he missed it but I told him to toss it back in the same area and sure enough about a minute later and after a nice little fight (on light gear) he caught his first ever Largemouth Bass! He was super excited about catching the second fish of his life. A bit later I started off with a Slip Bobber rig, A rig that some random guy at Black Butte Lake taught me to use. I wasn't sure if I was using it correctly but soon enough I learned. I tossed my line into the small feeder creek and let it drift into the main slough. This tactic proved to be a good one! A few minutes after using this tactic I hooked into a 13 in. Channel Cat. It swallowed up my bait and it took me a while to get the hook out so I didn't get a picture with it. A while later I hooked into my first crappie of the year and I put him on the stringer. I figured if I caught more I would take them home. My Last fish was another Channel Cat. It was a bit smaller than the first one but it was still a nice little catch. We took off around 8:30. 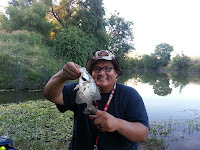 Even though the fish weren't too big, It was a good time fishing and my buddy had a good time. 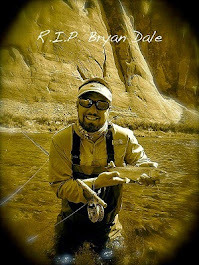 My buddy finished up the day wishing he had caught another fish and wanting to set plans to fish this week! Aside from that, we were successful because we caught 4 different types of fish at the same fishing hole! Well anyways, Thanks for reading and fish on folks! Just wait until you attack those with a fly rod. I can't wait, mark! Soon, very soon! Kudos to you, J., for getting your buddy away from the video games and out on the water. Good choice, too, in selecting some Panfish for your target. Almost guaranteed to catch a few of those guys. Nice assortment of fish. Happy hook ups! Thanks, mel! 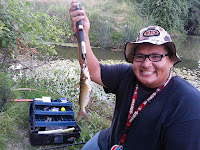 We did ok, I am realy glad we found that spot and that my buddy is getting into fishing! Very nice outing! Panfish are a blast! They are a good time! Haven't really pan fished much but I am starting to enjoy it! Thanks a lot, Bill! It was a pretty good trip! I like your blog man. I'm glad you like it, man! Please keep reading along! I will check out your blog as well!